Modern, stylish and crafted with impeccable attention to detail, each pair of men's Giuseppe Zanotti sneakers serves as the perfect piece to transition from office to after-hours. With an assortment of styles, colours and fabrics, Giuseppe Zanotti gives men style and functionality. 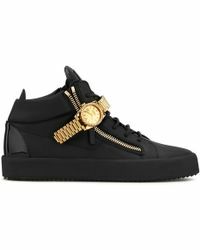 Whether you're looking for leather high-top sneakers or suede low-top sneakers, Giuseppe Zanotti has it all. Its key silhouettes include the Double Zip and Double Bar sneakers and the statement gold Giuseppe Zanotti high-tops.